Islamabad, January 02 (KMS): This piece is my first contribution in the New Year. It would be proper to wish peace, honour and dignity to all in the world. People living in the Valley of Kashmir have very little to celebrate. Every tool is used by Modi government to humble, dishonour and control them against their free will. We on this side of the cease fire line don’t have much to offer them. We have the opportunity to tell the story to the world. It needs the right narrative to give meaning to the suffering. It is just seventh month since UN published its 14 June 2018 report on “The human rights situation in Kashmir”, that on 26th December 2018 Yashwant Sinha a senior Indian politician has revealed in an “Off the Cuff with Yashwant Sinha” programme organised by a leading media group revealed that Modi Government, has abandoned the Atal Bihari Vajpayee’s policy of “Consensus, Democracy and Insaniyat” in favour of a “Strong State” policy in Kashmir, which means “use of brutal force to kill as many as you can”. He is a strong witness to take the UN Report a couple of steps further. Yashwant Sinha is not an ordinary witness. 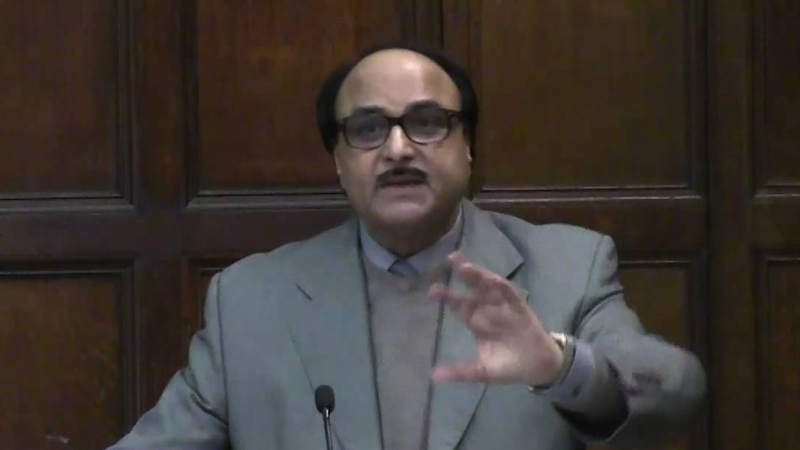 He has served as a Minister in the Cabinets of Prime Minister Chandra Shekhar and Prime Minister Atal Bihari Vajpayee and has visited Kashmir as head of a civil society organisation – Concerned Citizens Group (CCG) – several times and has interacted with various stakeholders to explore the possibility of finding a lasting solution to the Kashmir problem. Yashwant Sinha in an answer to a question asked by Rahiba Parveen, a senior journalist with The Print, told that the people of Kashmir Valley hate India much more than the people of Nepal hate India. He said, “The hatred in the minds of the people of the Valley is far stronger than Nepal. We have ruined our relationship with the people of Jammu and Kashmir, especially Kashmir Valley”. The secret that Modi government had a “Strong State Policy” to kill as many as possible to keep Kashmir was not known in this manner when the UN High Commissioner for Human Rights introduced the 14 June 2018 report on “Human Rights situation in Kashmir”. It is extremely disturbing. JKCHR has informed the Michelle Bachelet, the new United Nations High Commissioner for Human Rights, that the news would disturb Kashmiri diaspora living across the world and unless OHCHR addresses the revelation with post haste it could harm the good community relations between the communities of Indian and Kashmiri origin. There are over 2.5 million Kashmiri refugees living in various provinces of Pakistan and the latest information emanating from New Delhi could unfreeze the 5 out of the 6 elements frozen into a non-action by UN mechanism on Kashmir. Pakistan as a party to the Kashmir dispute and as a member nation of the UN has to rearrange itself on Kashmir. We shall be failing in our duty if the Indian soldiers, continue to operate with no holds barred under a State Doctrine to “use brutal force to kill as many as possible”. It is no more an issue of violation of Human Rights and violation of 7 restraints. It is surfacing as a genocide and constitutes a war crime. OHCHR in view of its 14 June 2018 report on Kashmir has a serious cause to consider calling a special session of Human Rights Council on Kashmir. There are more than 11 countries on the present Human Rights Council who have remained actively involved in UN Security Council debates on Kashmir and in finalising the mechanism for a UN-supervised referendum in Kashmir. We could easily convince (or at least make a start) one third of the Member States on the Human Rights Council to request a special session to address the Modi Government’s policy to “use brutal force to kill as many as possible” to keep Kashmir. The tragedy as I see is the lack of understanding or unreliable understanding of the jurisprudence of Kashmir case at various levels in Azad Kashmir and Pakistan. We raise the issue of Kashmir and leave it with one sentence that “India has failed to implement the UN Resolutions on Kashmir”. It is much more than that. Our banners generally read, “India go back. India implement UN Resolutions”. We don’t back our narrative with the jurisprudence that has developed at the United Nations. For example, Philippines at the 773rd Meeting of UN Security Council held on 20 February 1957, argued that “the sovereignty of India or of Pakistan is not involved in the proposal (Pakistani proposal) to send a United Nations force into the State of Jammu and Kashmir for a temporary and limited purpose”. In para 46 Philippines has strengthened its argument by stating that, “Under the circumstances and pending the holding of a plebiscite, neither India nor Pakistan can claim sovereignty over the State of Jammu and Kashmir”. Yashwant Sinha’s statement that Modi government has a policy to use brutal force in Kashmir to kill as many as possible is in the public domain. We need to intervene and protect the people. Pakistan should revive its proposal of 16 January 1957 made at the 761st meeting of the Security Council that the UN should send its forces into Indian occupied Kashmir. We have a UN Security Council resolution sponsored by Australia, Cuba, United Kingdom of Great Britain and Northern Ireland and the United States of America supporting the Pakistan’s proposal for a UN force in Kashmir.